Aeroflash contains high density pigments ground to fine-grain size (0.001 to 0.004mm) in an acrylic resin manufactured to the uniform viscosity most suitable for airbrush use. The result is a deep clear color of non-toxic archival permanence that will not clog even a 0.1mm aperture. 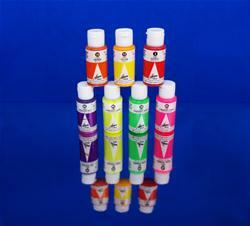 Aeroflash utilizes a pure water soluble acryl which insures no change in color tone from liquid to dried color.